Kids can practice fine-motor skills while exercising the brain with Twisterz Toys' line of ring-turning tubes that build words, tell stories and match letters to colorful images. Also in TDmonthly Magazine's roundup of newer specialty toys this month: Sandtastik's molding plaster to make bright sand animals, plus a classic, U.S.-made locomotive engine from Maple Landmark Woodcraft. Alphabet Matcher challenges children to choose a letter and find the five corresponding images that begin with that letter. For example, select the letter “F” and find Fish, Foot, Frog, Flower and Flag. An answer guide is included. Alphabet Matcher engages skills ranging from logic to spelling. It contains three extra sets of rings, covering 24 letters and 120 images. 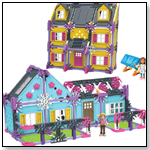 Awards: Dr. Toy 100 Best Children's Products - 2010; 2011 PAL (Play Advances Language) Award. 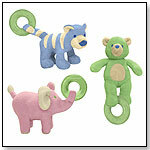 Organic, BPA and PVC free, this plush animal with teething rings entertains baby. The plush animal is made from organic cotton terry with organic cotton fill, and the EVA teething rings can be chilled in the refrigerator for a soothing effect. Sandtastik Plaster Mix by SANDTASTIK PRODUCTS, INC.
Other products from SANDTASTIK PRODUCTS, INC.
Sandtastik supplies safe non-toxic colored PlasterMix in 8 different colors including white, yellow, blue, purple, red, brown, orange and green molding PlasterMix. PlasterMix is perfect to use with Plaster Molds, for creating exciting craft projects like handprints or animal paw prints and can even be used as chalk when dried. Available in 1 kg bags, 10 kg bags, and 5 lb bags. Custom Packaging also available. Scoot Train Engine by MAPLE LANDMARK WOODCRAFT CO.
Other products from MAPLE LANDMARK WOODCRAFT CO.
From the My Little Scoot collection, Train Engine Scoot is the perfect size for play mats, crafted from pine and approximately 4" long. This Scoot Train is modeled after the great locomotives of years past. Non-toxic clear finish and inks are used. Barbara Rainville, Marketing Manager at Maple Landmark Woodcraft, told TDmonthly, "The Scoot Train is made in the USA." Launch date: March 2010. Available in size 0-6 months, these gender-neutral socks feature little yellow ducklings waddling over a bright white background. Soy-based, non-skid grips make this American-made product eco-friendly. This wooden shoe is designed to teach kids how to lace and tie their shoes. The loops are cloth and it comes with a lace. Eco Stars are 100-percent recycled, star-shaped crayons collected from children across the country by the National Crayon Recycle Program. This set of 10 Eco Stars comes in environmentally friendly packaging made from renewable resources. These popsicle-colored bracelets come in glittery and translucent shades, including Lime, Cherry, Grape and Blue Hawaiian. As with other bracelets by Shainsware, kids can change out the elements (letters, symbols, etc.) to personalize the band. — In an October 2011 survey, Katie Rook, manager of Be Beep Toys in Columbia, S.C., told TDmonthly that Shains bracelets are her best selling jewelry. Thanksgiving Adorable Kinders® Paper Doll Set by GRANZA INC.
Other products from GRANZA INC. This 18-piece Thanksgiving set includes eight Adorable Kinders Paper Dolls (four boys and four girls) and eight outfits (two Pilgrim Boy, two Pilgrim Girl, two Indian Boy and two Indian Girl), a glue stick and blunt-tip scissors. The dolls are made of durable, UV-coated card stock and come with a foot stand. They are perforated for easy removal and assembly. HOUSECLEANING SET-n-RACK by JONTI-CRAFT INC. This set includes a corn broom, push broom, whisk broom, dust pan, and two wet mops. The unit is 11" x 11" x 18" and features an ultra-violet KYDZTuff finish that "is as tough as a gym floor and allows marks from common items to be simply wiped away," Jonti-Craft Marketing Associate Melissa Gustafson told TDmonthly. Skyflight's whimsical mobile is designed to entertain infants with its constant motion. The mobile is made in the United States from archival art board, and is printed in lead-free, non-toxic colors. An informative fact sheet is included. These doll-sized toy buggies are styled in varying fabrics with true-to-life details and functionality. 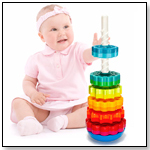 The toys are suitable for a doll sized 15" to 19." In the game of Cornerstone, players build and climb towers in a race to reach the top. Each turn, players build by strategically placing blocks, gaining a better vantage point for their climber, or blocking an opponent as the towers grow taller and more unstable. Matt Mette, Co-Founder of Good Company Games, told TDmonthly, "This game is universally appealing." Awards: 2009 Mensa Select; Parents' Choice Silver Honor. Launch date: October 2008. •TDmonthly Goes Inside .... Neely's, South L.A.